Lena Wilson is to stand down as chief executive of Scottish Enterprise after almost eight years at the helm of the economic development agency. The move led to calls for her replacement to devote “undivided attention” to the job. Ms Wilson broke the news that she is to leave the £210,000 a year post after eight years at the helm to the quango’s employees yesterday morning. Scottish Enterprise said its chairman Bob Keillor was now working on a “transition plan”, which included the appointment of Ms Wilson’s successor. The organisation declined to comment when asked if Ms Wilson would receive a severance package and said a leaving date would be confirmed in due course. Ms Wilson, whose salary as Scottish Enterprise chief was fixed between £210,000 and £214,999, sparked controversy in 2012 when she became a non-executive director of industrial testing group Intertek – a role for which she received £69,000 last year. Last night Scottish Lib Dem leader Willie Rennie said the Scottish Government should ensure that there is no repeat of the controversy when a new chief executive is appointed. Mr Rennie said: “I wish Lena Wilson well as she moves on from Scottish Enterprise. Whilst I disagreed with the decision to allow her to take a directorship with Intertek whilst she was heading Scotland’s economic development agency I respected her and the work she did on our behalf. Mr Keiller, the former boss of Aberdeen-based oil and gas services giant Wood Group, paid tribute to the out-going chief executive. He said: “Lena has done an outstanding job as chief executive, driving a much more international mindset across the whole organisation and overseeing record levels of innovation and growth among the companies Scottish Enterprise works with as a result. Mr Keiller added that plans to appoint Wilson’s successor were “being developed and details of this will be released in due course”. Before taking the top job at Scottish Enterprise, Wilson was chief executive of Scottish Development International. Between 1998 and 2000, she was a senior adviser to the World Bank in Washington on private sector development for developing countries. 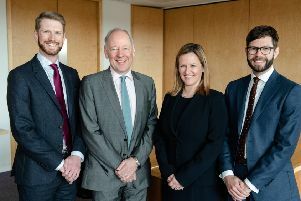 She is also an ambassador for the Prince and Princess of Wales Hospice and Edinburgh Military Tattoo, a member of the Financial Services Advisory Board and chair of Scotland’s Energy Jobs Taskforce. Ms Wilson said she intended to pursue “a fresh set of challenges”. “It has been a real honour and privilege to work with so many talented people who want to make a positive difference for Scotland,” she said. First Minister Nicola Sturgeon and Economy Secretary Keith Brown thanked Ms Wilson for her contribution.